The total market size for organic packaged food and beverages in the UK in 2017 is US$1,558.4mn, making it the 6th largest market in the world by value. Per capita spending on organic packaged food and beverages in the UK is US$23.68, which ranks as the 17th largest spending per capita in the world. 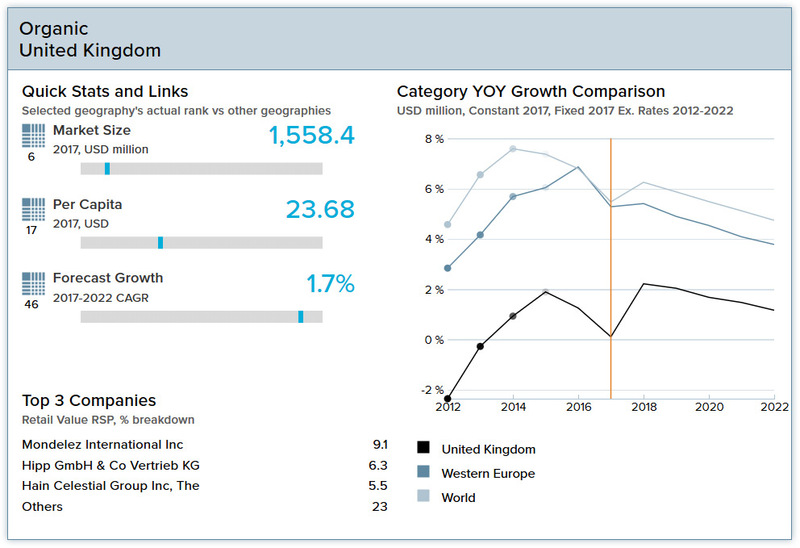 The largest company by sales in organic packaged food and beverages is Mondelez International Inc, which maintains 9.1% of total sales, followed by Hipp GmbH & Co Vertrieb KG and Hain Celestial Group Inc.
Organic packaged food and beverages in the UK will see slow year-on-year growth of close to 2% in 2018. This is slower than the rest of the Western Europe region, which will experience 5%-6%% year-on-year growth in 2018. The UK maintains a market size for organic packaged food and beverages of US$1,558.4mn in 2017, which is 3.9% of global category sales. Within the Western Europe region, Germany, France and Italy surpass the UK in total value sales of organic packaged food and beverages. Despite the large market size, the UK will experience slow forecast growth of sales of organic packaged food and beverages, at a 1.7% CAGR from 2017–2022. The organic packaged food and beverage landscape in the UK is highly fragmented and competitive, with no single company holding more than 9.1% market share. While many UK consumers are aware of and interested in organic packaged food, organic beverages remains somewhat of a niche category. Organic packaged food and beverages are premium-priced in the UK, and are widely available across most retail outlets, including supermarkets, discounters, and convenience stores. Organic packaged food and beverages sales value growth was essentially stagnant in 2017 following several years of modest growth. Organic soup and organic confectionary sales values have posted healthy growth rates in recent years, but several categories have seen sales values decline, including organic bread and organic edible oil. The organic packaged food and beverage landscape in the UK is highly fragmented and competitive. No single company currently holds more than 9.1% market share. Mondelez International is the market leader with 9.1% value share, followed by Hipp GmbH & Co Vertrieg KG with 6.3%. UK consumers are increasingly concerned about the provenance of their food and beverages, and are looking for locally produced options. Domestic organic food and beverage companies are projected to grow their market shares in coming years. Sales value of organic food and beverages is projected to grow slowly in coming years as the market continues to mature. The outcome of Brexit negotiations will affect growth prospects, as imports from European countries could decline after the UK leaves the EU. Organic baby food and organic concentrates are projected to post the highest sales value growth rates in coming years. Sales of health and wellness products in the UK have recorded slow but steady growth in recent years, driven by consumers’ increasing health consciousness and government and media efforts to promote healthier lifestyles in the face of rising obesity and diabetes rates. Consumers are increasingly opting for naturally healthy packaged food and beverages over other types of products, particularly those that contain high levels of sugar or artificial sweeteners. In 2017 real GDP growth was 1.5% in the UK, and 1.2% growth is expected in 2018. Due to uncertainties surrounding Brexit, investment will slow and consumer spending will weaken in 2018. Unemployment was 4.5% in 2017, and that figure is projected to rise to 4.9% in 2018. The population of the UK was 65.8 million in 2017 and is projected to reach 69.5 million in 2030. The UK’s population is aging: In 2017 the median age was 40.1 years, which was 2.6 years over the median age in 2000. The portion of the population over age 65 is projected to rise to 22.0% by 2030, which will put strains on government finances and the economy. Per capita disposable income in 2017 was US$25,503, and total disposable income is projected to grow at an annual average rate of 1.9% through 2030. 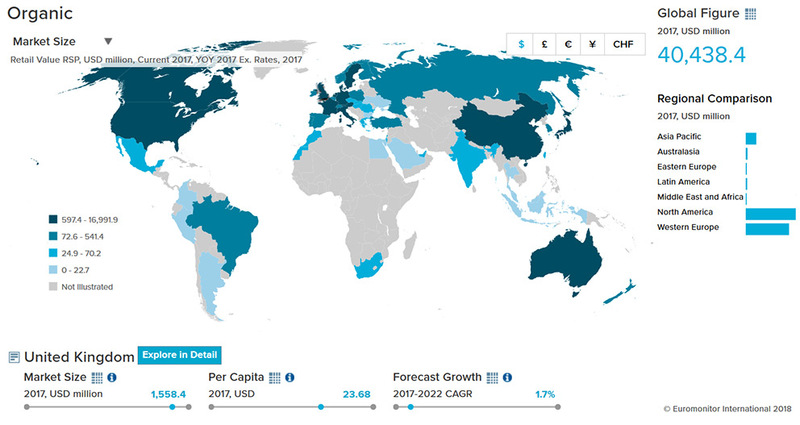 Total consumer expenditure is projected to grow at an average annual rate of 1.7% through 2030. Description: Provides the latest news on organic imports. Includes information on products imported from outside the EU as well as inside the EU, a guide on Implementing Regulation 1235/2008, a list of products imported from third countries where the control body has been recognized as applying equivalent standards and products imported from other third countries under a Member State Authorization. Description: information pack created as a basic guide to anyone wishing to import or export goods. It acts as a guide to help anyone get started on importing and / or exporting, and also provides a better understanding of the procedures involved in these activities. Description: Includes information on what to do before importing, the banned or restricted products, advice about imports, the different legislation for importing food. Description: This office represents the interests of U.S. agriculture and promote the sale of American food and agricultural, fisheries and forestry products in England, Scotland, Wales and Northern Ireland and provides trade services both for local companies seeking U.S. products and for U.S. companies wishing to develop markets in the UK.